keeps an eye on the BatAction machine workouts. This parent should make sure that the players work with quality in mind and that by-standers stay a safe distance from the machines workout zone. pressure and concentrate on the job at hand. The BatAction is Great For Bunt Practice too! merely bunts the BatAction Self-Trainer or stops the ball using proper bunting technique. A BatAction Hitting Station Is Great For Remedial Hitting Practice. before practice or after practice to use the Self-Trainer. average hitters step up to the next level and become great hitters! Using the BatAction Machine Will Definitely Help Win More Games? The BatAction Machine offers teams many advantages including economizing time, energy and effort. 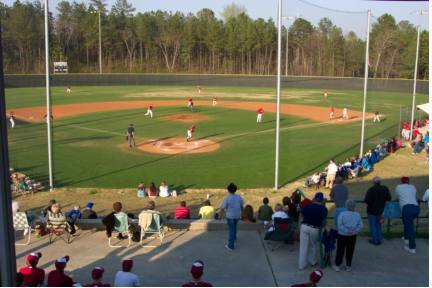 It also maximizes drill productivity to develop incredible skills and bat speed. Championship teams have good pitching, play solid defense and hit the ball against good pitching. The BatAction Machine will double or triple the amount of actual practice swings that your players will take each day. More quality practice means increased skills, better hitters and more wins. Using the Machine For Team Practices? The machine is setup in a location that is safe and out of the way. There will be players hitting on it all day. I suggest having each player do a set workout including hitting all pitch locations and the specific purpose drills. I suggest writing the drills on a sheet of paper and attaching it to the fence near the machine. The player can follow the workout and this makes sure every drill is done daily. This is a suggested daily workout. not quantity is the goal. The Switch-Hitters drill may be added for those players that hit from both sides. Switch hitters should do a double workout taking swings from both sides. The Bring-By drill is often performed with the power bands removed from the machine. There are always players that arrive early for practice. These players can make valuable use of this extra practice time by using the Self-Trainer. The first thing that you should do when you arrive at the field is setup the machine. In about 5 minutes, it is ready to go! The last thing that you will do before you leave is take the machine down. I can guarantee that your players will not have to be told to work out on this machine. They will love hitting the machine. Its fun and challenging exercises will motivate your players. Extra Workouts Make the BatAction Self-Trainer the ABSOLUTE BEST INVESTMENT! We have all had it happen. A big game is Saturday. Friday, it rains all day. Its too wet for outside workouts. You go to the gym and find that the girls basketball team is using it. What do you do? Find a dry place somewhere under a carport or awning. You can now have team batting practice on the BatAction Self-Trainer. The practice is saved. Have you ever have a tournament game in which you had a key batter go 0-fer and lose his confidence. You need a chance to build him back up. You need a chance to take batting practice. There is no time. You get home too late. And the team leaves for a early game in the morning. In these cases, the BatAction Self-Trainer is perfect. Take it with you to the game. It sets up in minutes. The entire team can workout on it in a very short period of time. That key batter can get the confidence back. At night, the Self-Trainer can be used under a street light or spotlight for late night emergency workouts before big games, the next day. 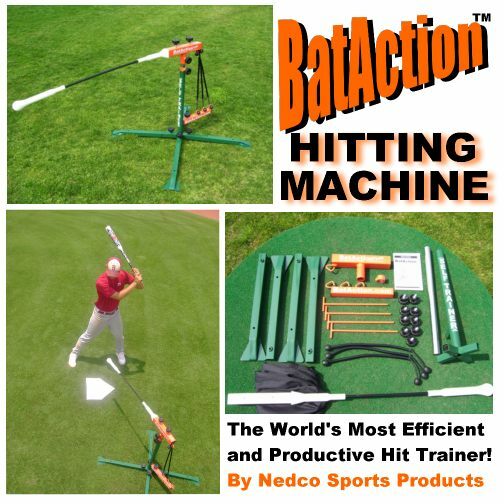 Year-Round Workouts With The BatAction Machine Will Make Average Hitters Great! Make sure that your BatAction Self-Trainer is used all year. In the off season, set it up in a garage or in the backyard so that it is always available for workouts. Players will often get the urge to hit and do what we call impulse workouts. These extra practice swings make them better hitters. So never, store your machine away! Keep it set up so it can always be used. Something this good needs to be used all year!